Woody Kincaid missing class for an exciting reason! Ten days ago, Woody (William) Kincaid, an MBA business student at the University of Portland, missed his Negotiation Skills BUS 523 class for a very exciting reason. He traveled to Hayward Field, also known as TrackTown USA, in Eugene to participate in the US Olympic Track & Field trials. He ran in the 5000m event, not only winning the heat at 13:47.86 Q , but achieving the fastest time in any of the qualifying heats. Going into the finals on Saturday July 9, 2016, Woody knew he had to beat his personal best to win a position on the Olympic Team. He finished his 5000m event with a time of 13:39.96! Fantastic finish, beating his personal best. He placed 8th but we are thrilled that he had the opportunity to try out for the Olympic Team. 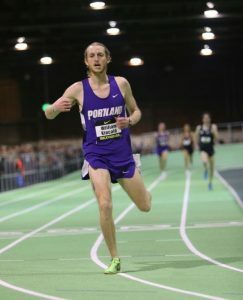 Woody has been running for the University of Portland for the last four years and about a year ago he made some training changes that increased his speed dramatically that in turn led to these Olympic Team trials. While he may not be going this time to the Olympics, we are very proud of Woody and what he has accomplished. He is our Olympic Champion at UP! Go PILOT!! See his running results on July 4th and July 9th.